An Exclusive, Hush-Hush Evening. A Private Room. No Stage. No Microphones. Just You, The Boys & A Piano. Only 30 seats available. 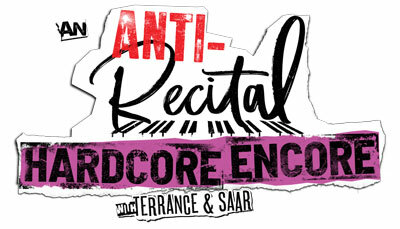 A ticket to the Anti-Recital & a snuggly space around the piano next to Saar & Terrance. Only 5 seats available. A ticket to the Anti-Recital (including said snuggly space) & a sophisticated Wine & Cheese rendezvous with Terrance & Saar on the afternoon of the show. Only 4 seats available. Play a board game with Saar & Terrance in a hidden parlour on an off-night between Recitals.